Hanover, Germany, August 18, 2015. In weight-intensive volume transport, optimizing every last cubic meter of loading space is essential. Continental has developed new trailer tires especially for mega liners, which help maximize the permitted total height of four meters. The Conti Hybrid HT3 435/50 R 19.5 is the latest addition to the Continental portfolio. The new trailer tires, in sizes 435/50 R 19.5 and 445/45 R 19.5, are characterized by a high load capacity and optimal service life, combined with a lower diameter. Like comparable 22.5" format tires, the new Conti Hybrid 435/50 R 19.5 and Conti Hybrid HT3 445/45 R 19.5 allow an axle load of 9 tonnes. At the same time they allow the best use of the 3-meter internal load height, when used on the semitrailers of mega liners. Their optimized tire contours and balanced load distribution give the trailer tires an even wear pattern, which helps ensure a long service life. The developers have also succeeded in cutting the rolling resistance of the new trailer tires by 15 percent compared with their predecessor. As a result, both tires have been classified a "B" for fuel efficiency under the EU tire label system. The Conti Hybrid HT3 435/50 R 19.5 and Conti Hybrid HT3 445/45 R 19.5 reduce fuel consumption in both regional and long-distance transportation. 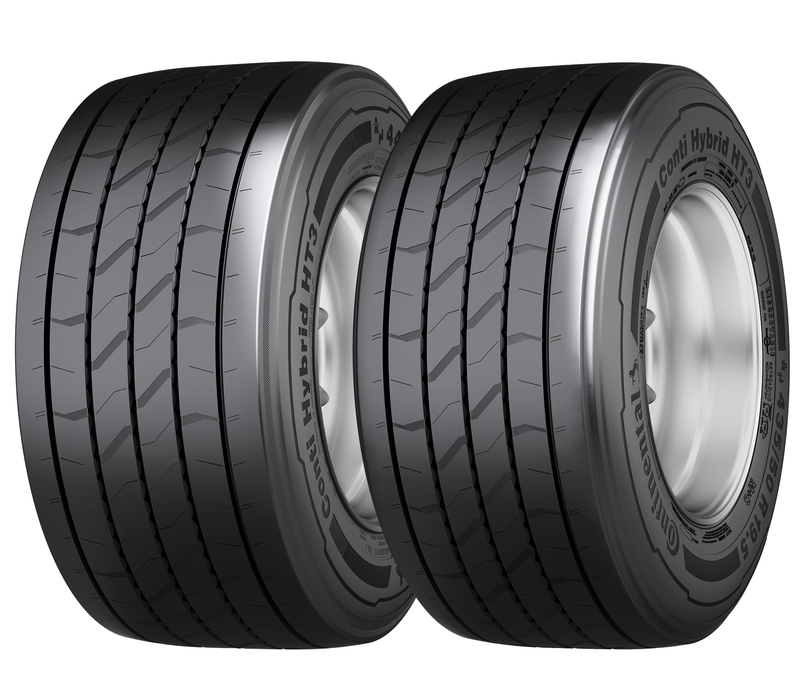 The new trailer tires Conti Hybrid HT3 435/50 R 19.5 and Conti Hybrid HT3 445/45 R 19.5 provide maximum service life and considerably improve fuel efficiency for volume transport for regional and long-distance transportation. The new tire contour and tread design make the trailer tires particularly robust, especially in the shoulder area. Together with the "Plus Volume Pattern," which is characterized by the high volume of rubber on the tread, these features ensure a long service life with even wear. The optimized design of the inner tread grooves prevents stones from getting trapped. The external tread grooves are designed to be particularly robust, to optimize the tire life. Both the Conti Hybrid HT3 435/50 R 19.5 and Conti Hybrid HT3 445/45 R 19.5 feature the M+S (mud and snow) symbol. Like all tires in the Conti Hybrid family, both new trailer tires have been designed to work with the trusted ContiLifeCycle solutions. Special indicators in the tread of the premium casing display the regrooving depth. In addition, the casings of the Conti Hybrid HT3 435/50 R 19.5 and Conti Hybrid HT3 445/45 R 19.5 feature the patented AirKeep® inner liner to prevent creeping pressure loss. The steel cord bead chafer and the new rubber coating compound of the belt optimize the retreadability of the tires.